Recognising the importance of policy integration for achieving the Sustainable Development Goals (SDG), the Institute for Global Environmental Strategies (IGES) initiated a project on "Sustainable Development Goals Interlinkages and Indicators” in 2015 focusing on SDG indicators and the interlinkages between SDG targets. The project identifies the causal links between SDG targets based on literature review and the results from relevant international consultation processes on SDG indicators. Indicators with trackable data are identified for SDG targets based on the official indicators that are enlisted in the Global Indicator Framework for SDGs and Targets and various data sources. The identified causal links between targets are further quantified for nine Asian countries (Bangladesh, Cambodia, China, India, Indonesia, Japan, Republic of Korea, the Philippines and Viet Nam) based on the correlation of the time series data for the indicators. Using Social Network Analysis techniques, the structure of the interlinkages network was analysed and SDG targets which play strategic roles in the network were identified from a systemic perspective. Country-specific dashboards indicating potential synergies and trade-offs between SDG targets are provided. 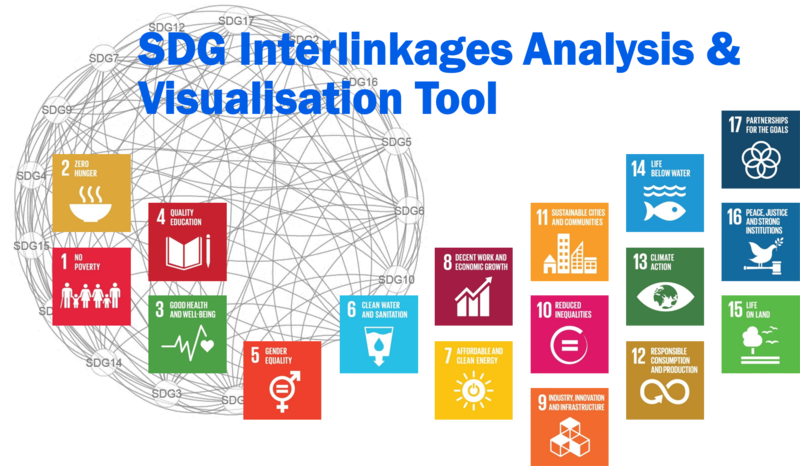 IGES developed a practical web tool, SDG Interlinkages Analysis & Visualisation Tool, to enable the users to visualise the interlinkages, explore indicator-level data and compare SDG targets and among countries. This project is expected to support national SDG planning, prioritising and monitoring of SDGs and enhance policy integration across the 17 SDG areas. Sustainable Development Goals (SDGs) and targets interact with each other in an indivisible way. On the one hand, achieving one goal or target may contribute to achieving other goals or targets. For example, enhanced food security (Goal 2) will reinforce poverty eradication (Goal 1). On the other hand, the pursuit of one target may conflict with the achievement of another. For example, an increase in agricultural production to help end hunger (Goal 2) can result in an increase in water use which may compete with water demand for achieving universal access to drinking water (Goal 6). The SDGs and targets form a complicated network of interlinkages. Analysing the interlinkages can help minimise conflicts, avoid trade-offs and seek synergies for making achievements inclusively across all 17 SDG areas (see more on Methodology). The web tool, SDG Interlinkages Analysis & Visualisation (V2.0), enables users to visualise the interlinkages between SDG targets and explore indicator-level data for nine Asian countries (Bangladesh, Cambodia, China, India, Indonesia, Japan, Republic of Korea, the Philippines and Viet Nam). Users can make selection of countries, Goals and Targets to see the interlinkages between selected targets and others and explore time series data for selected indicators. In addition, the web tool enables users to compare indicator-specific data and target-specific interlinkages among countries. Provided for free, users can download the data in Excel tables as well as the visualisation charts in image files.